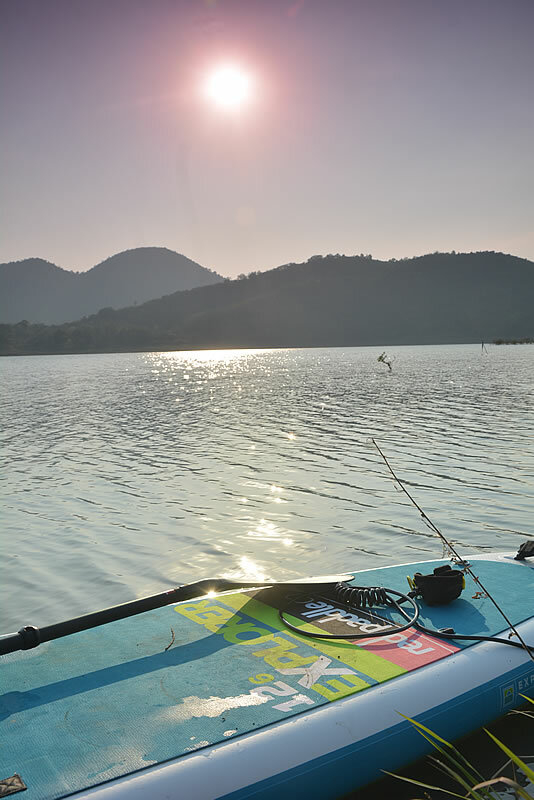 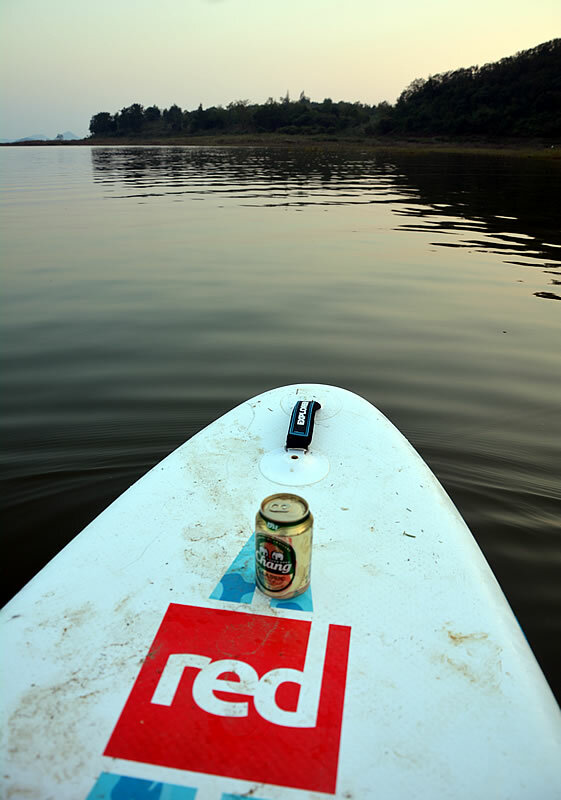 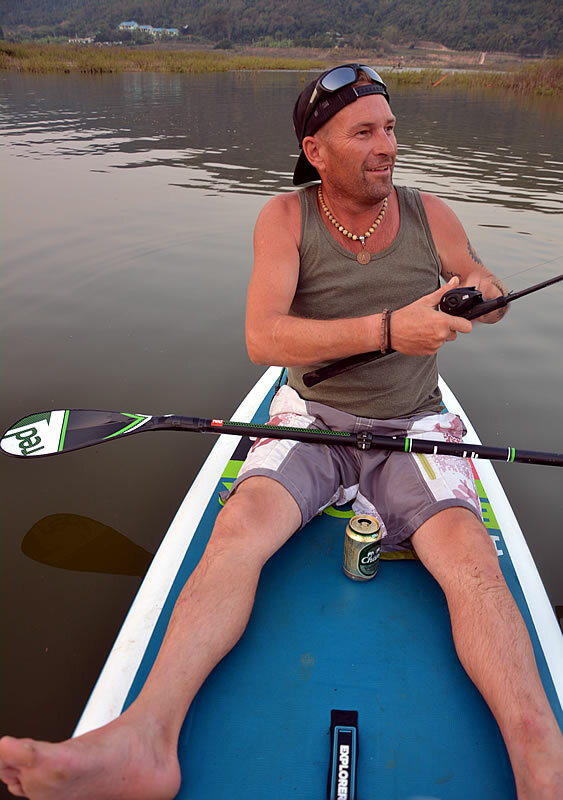 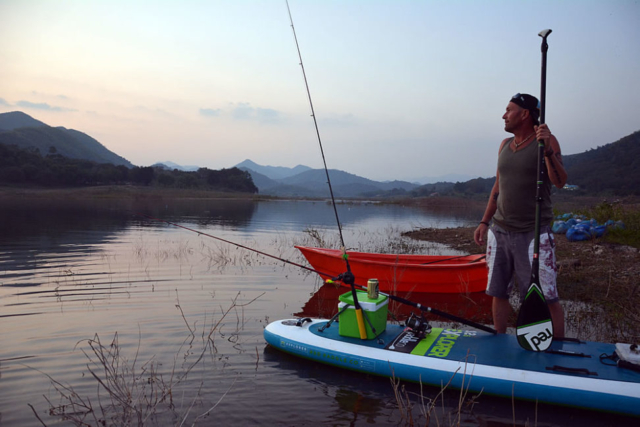 We decided to make use of the long weekend by getting on the road again with a truck full of tents, camping gear, fishing rods, three days food supplies, an esky of beer, and a paddle board. 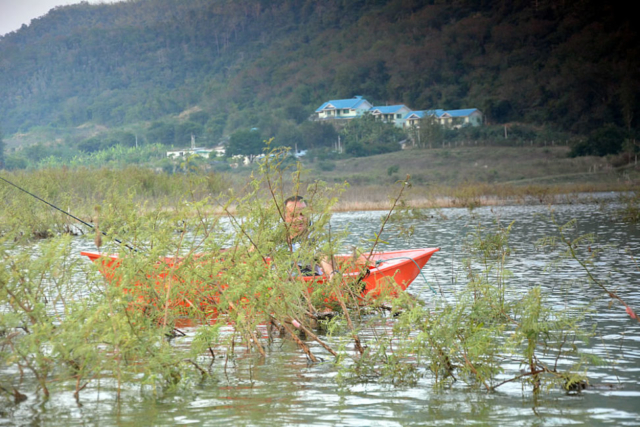 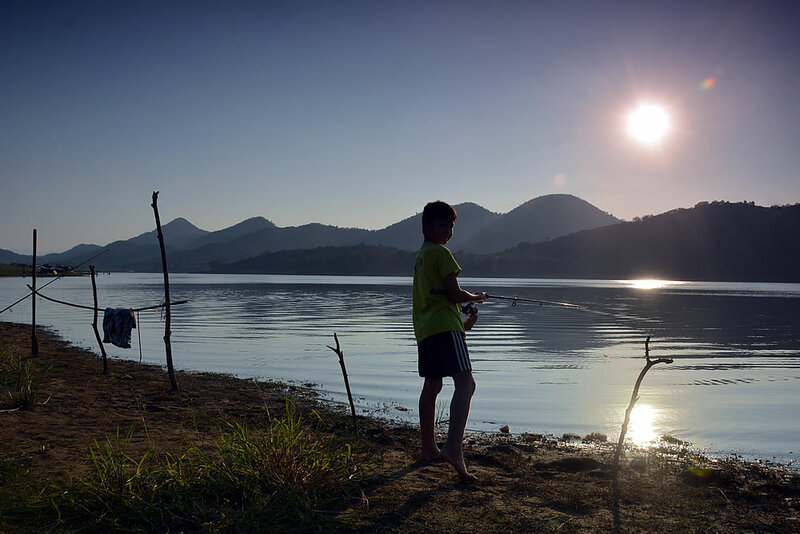 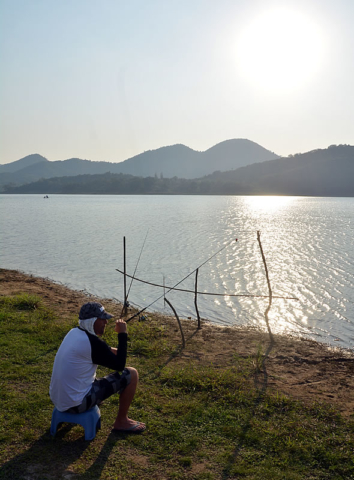 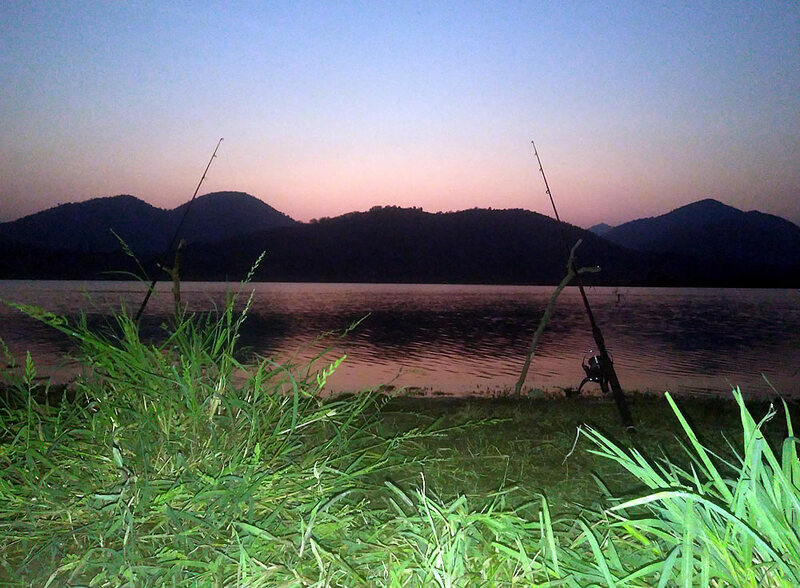 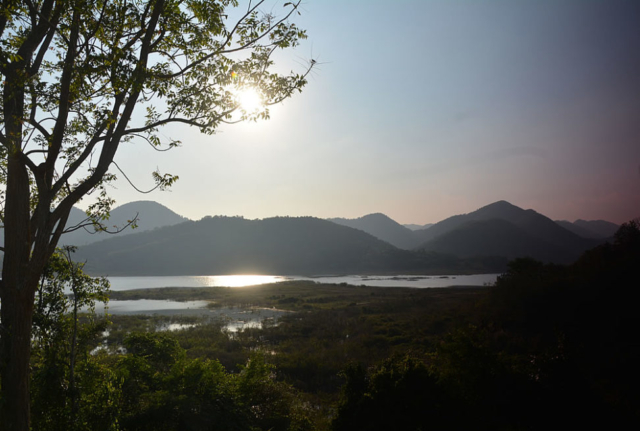 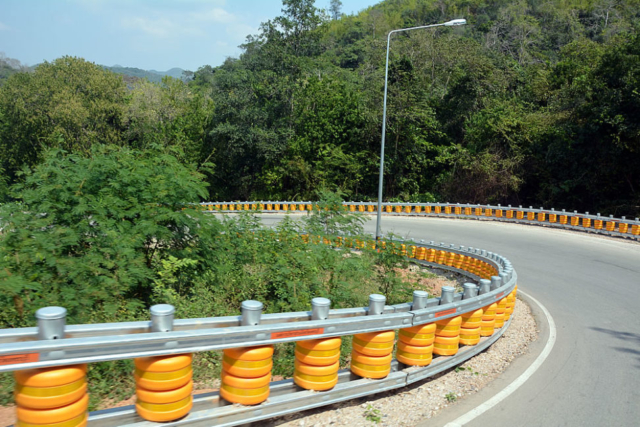 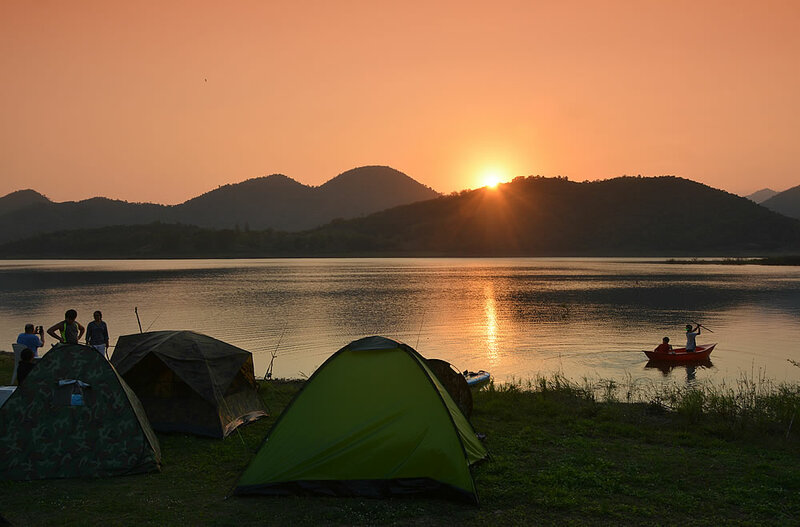 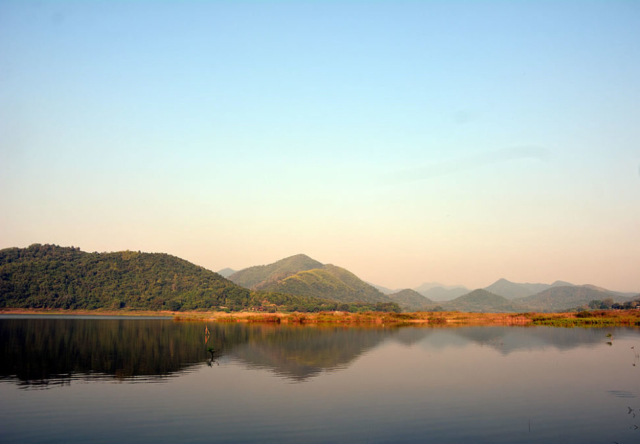 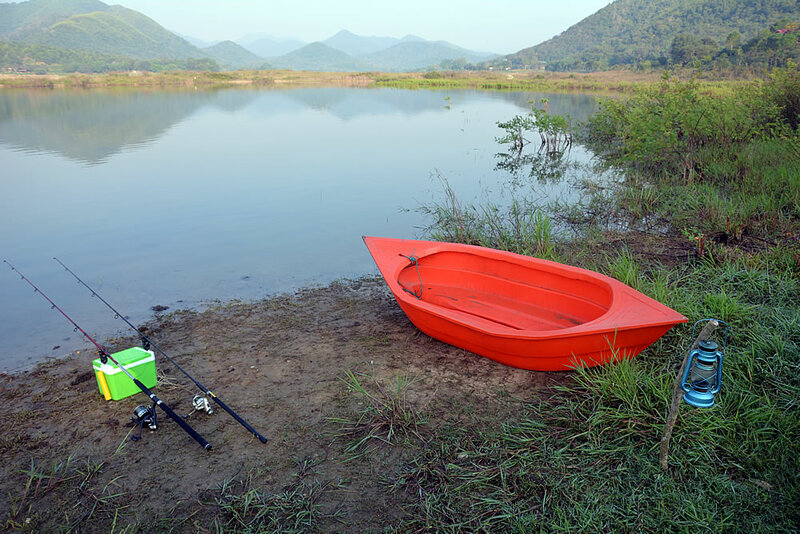 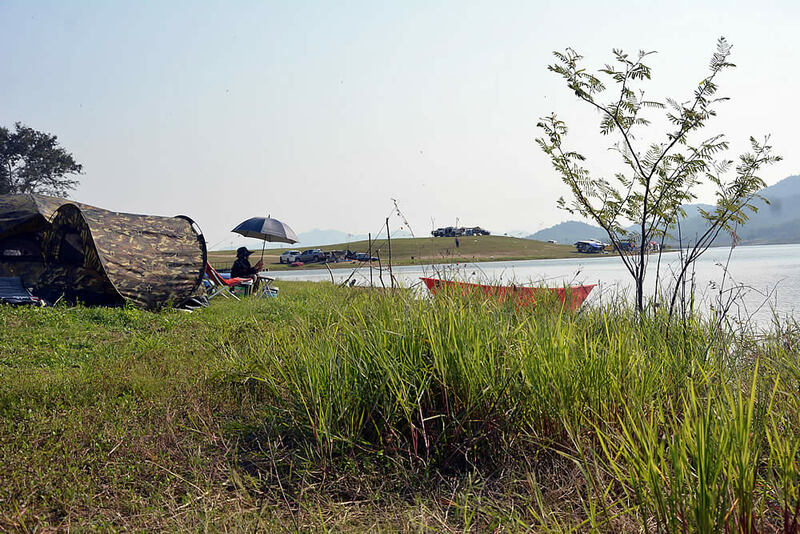 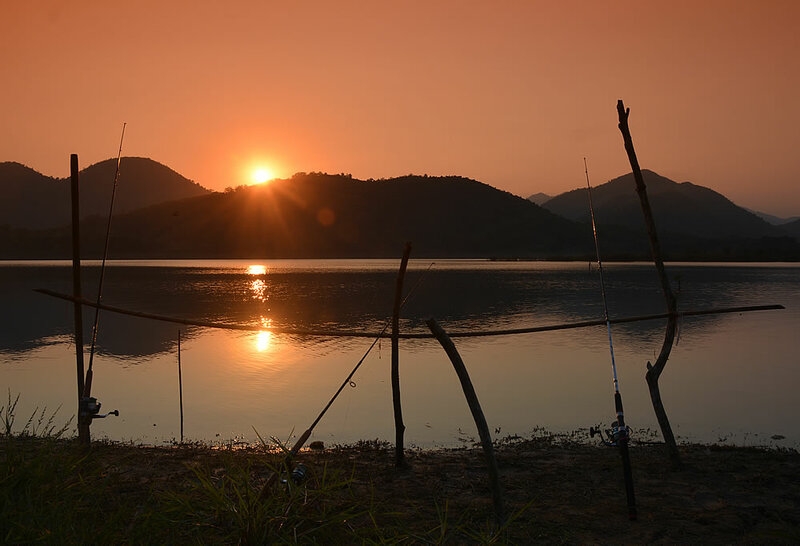 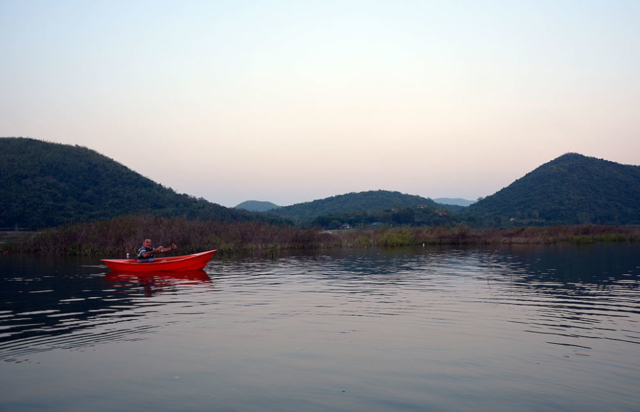 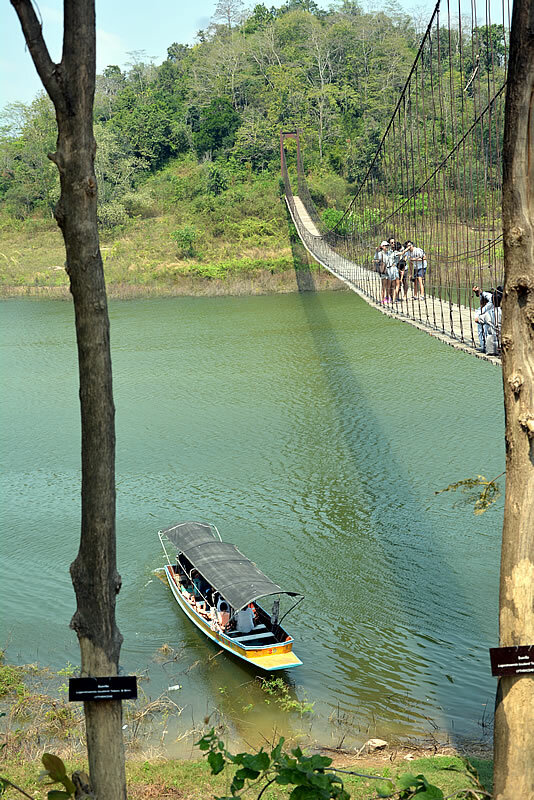 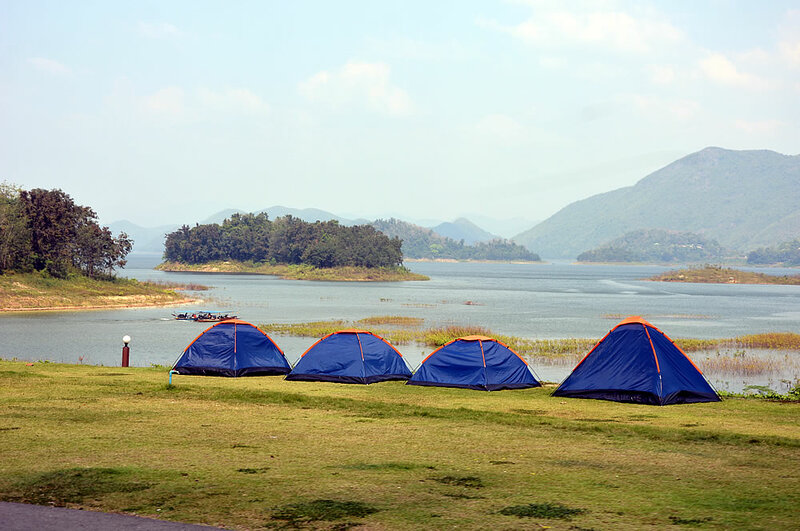 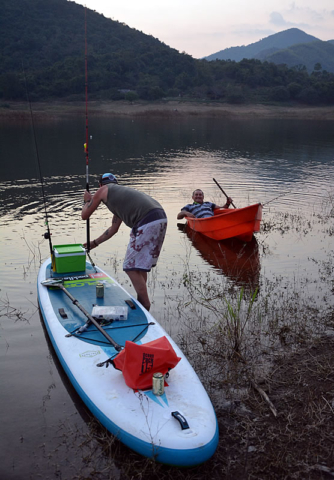 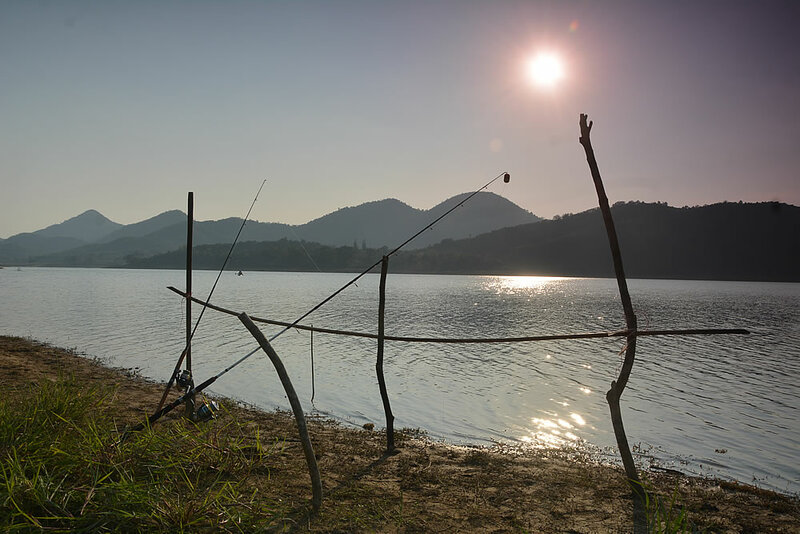 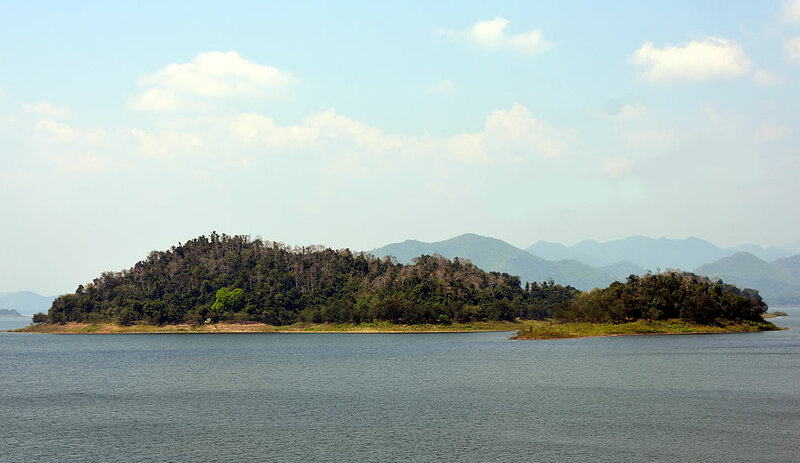 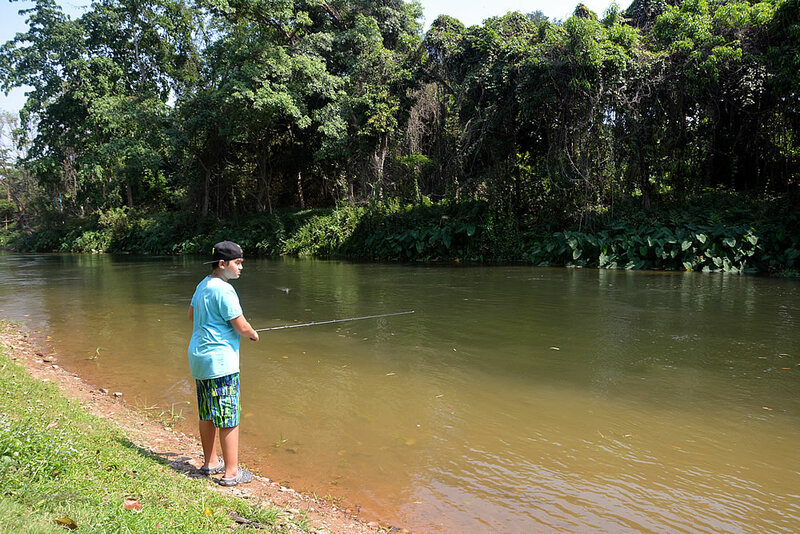 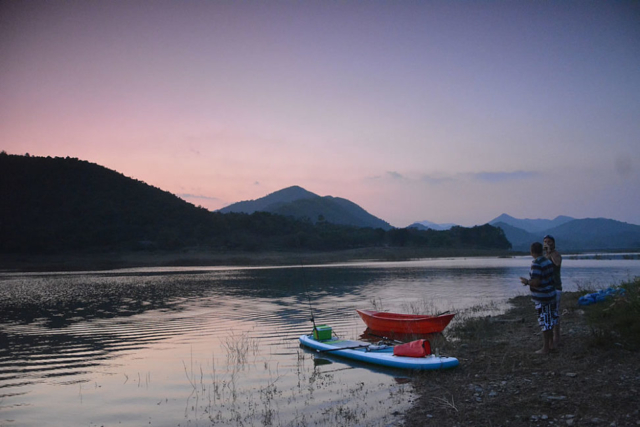 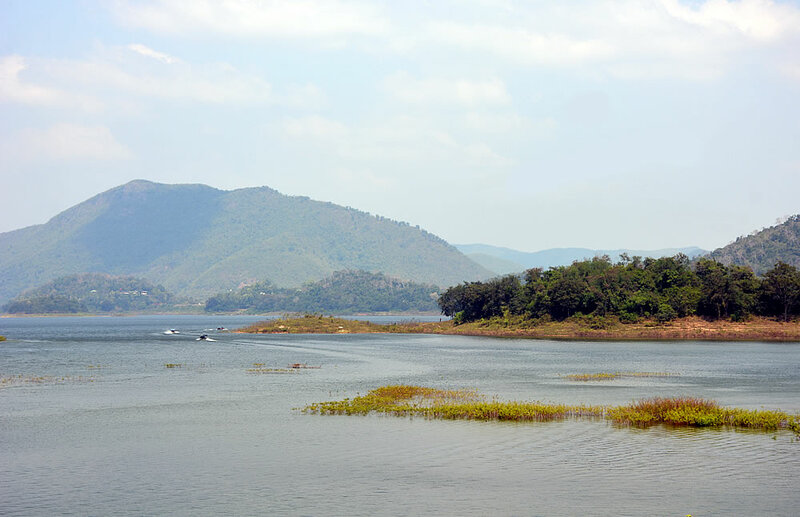 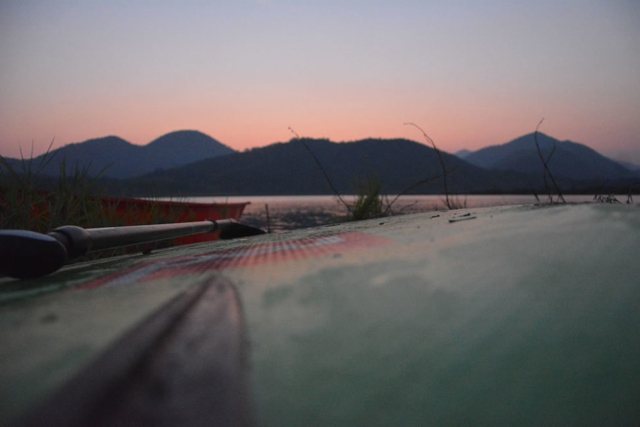 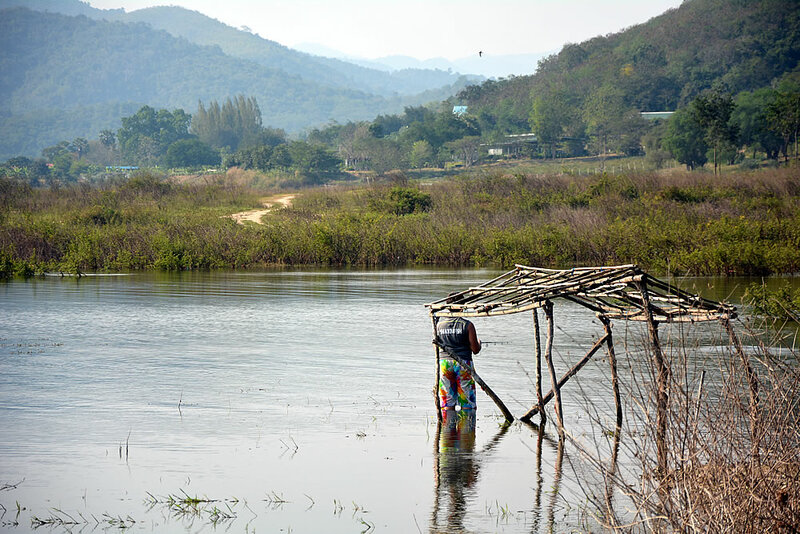 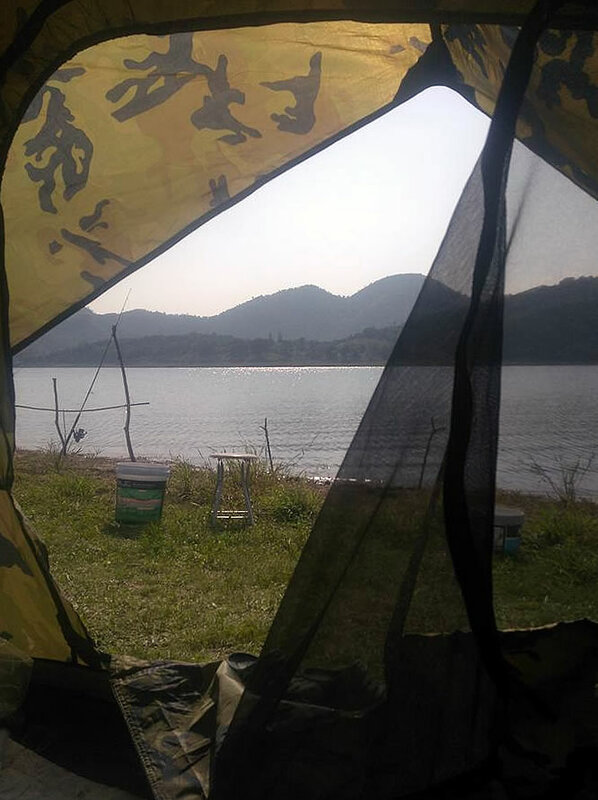 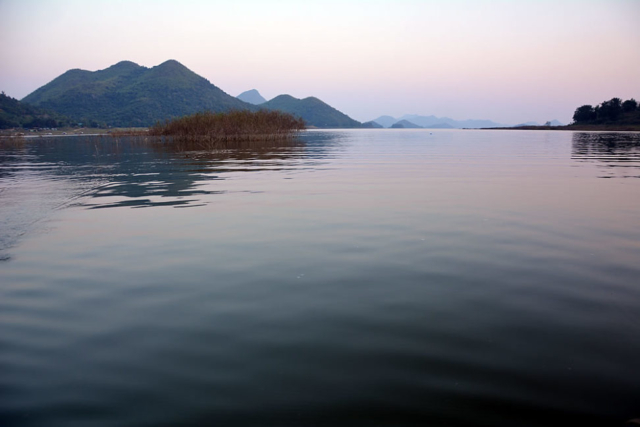 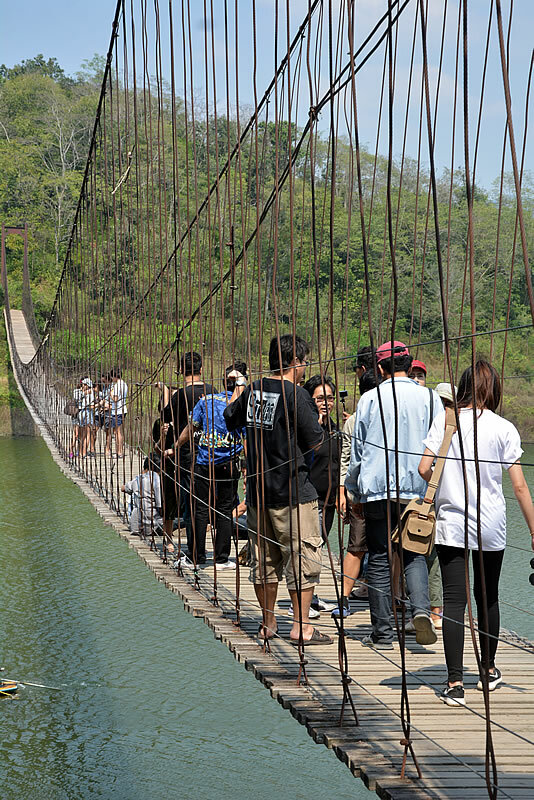 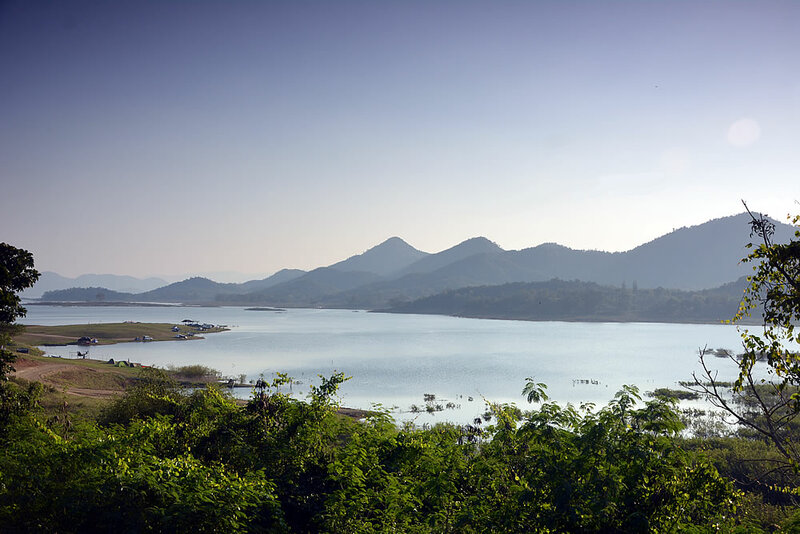 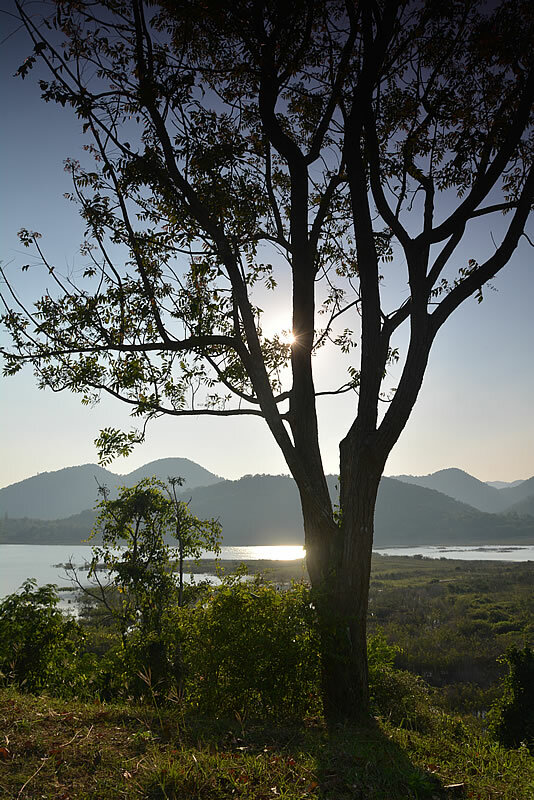 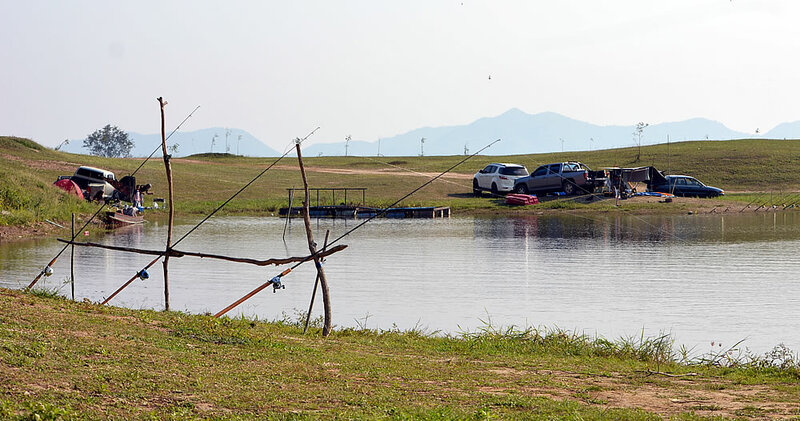 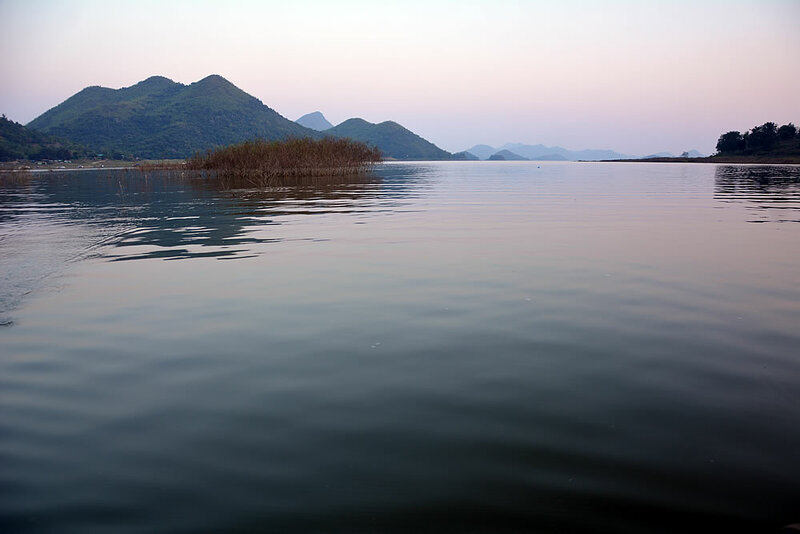 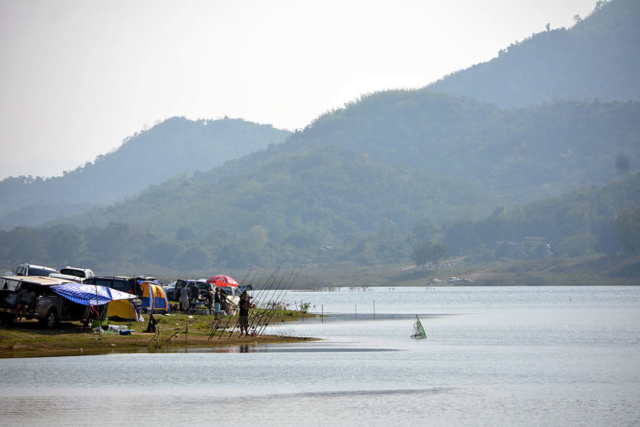 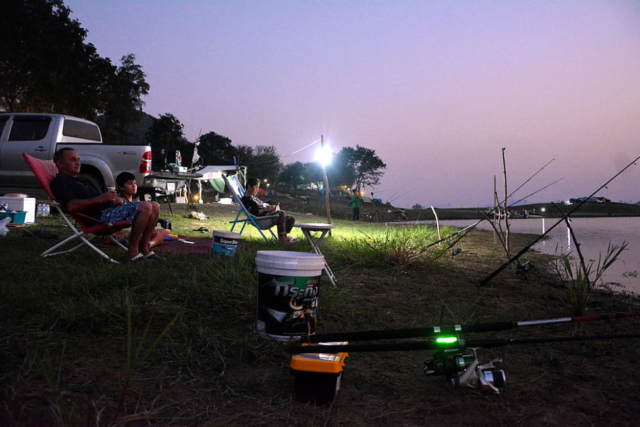 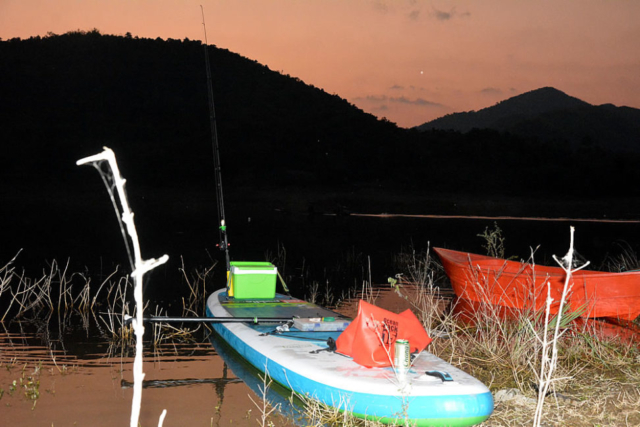 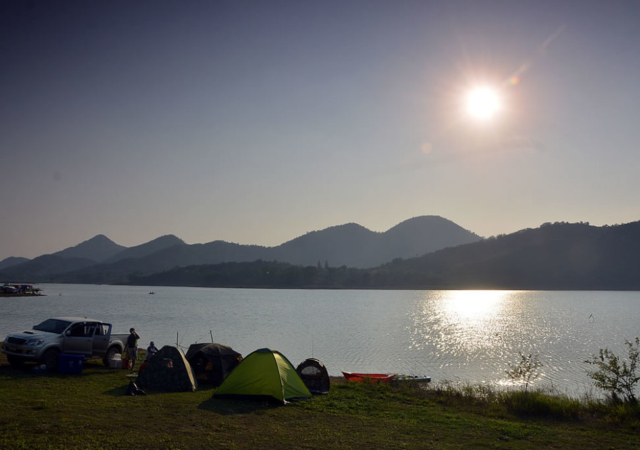 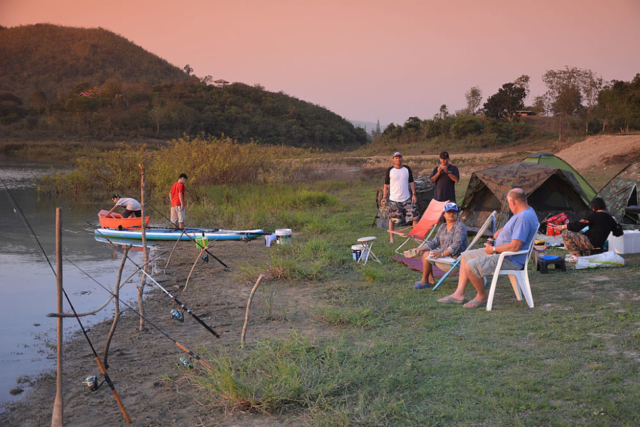 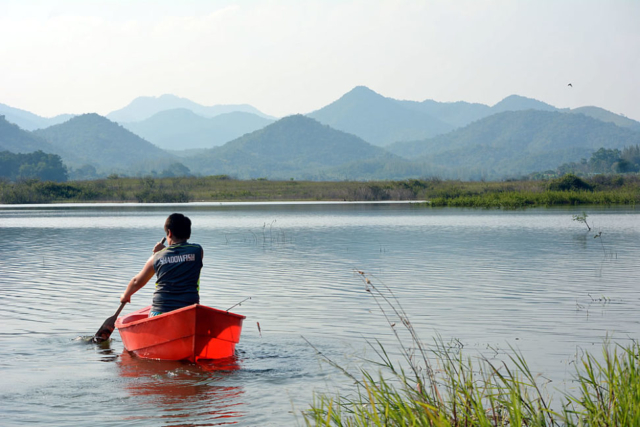 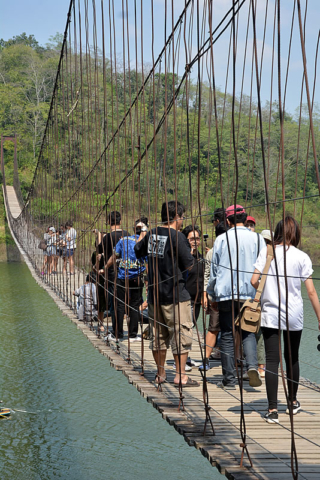 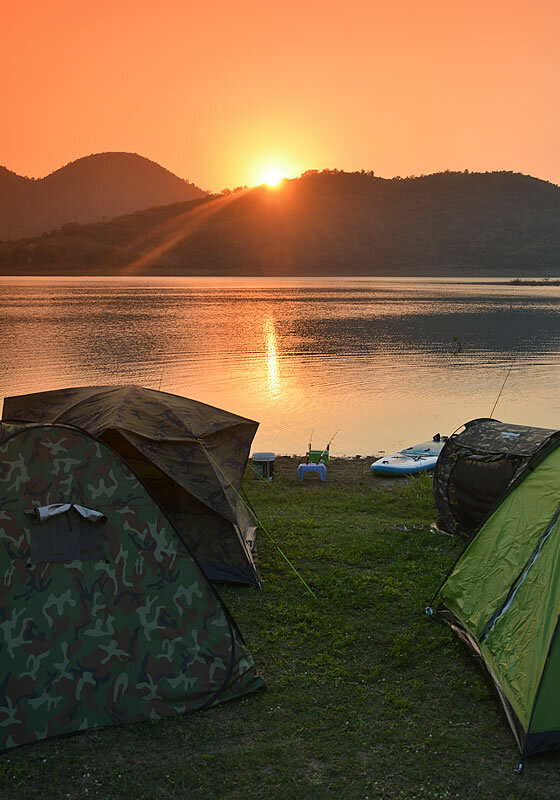 Since we usually travel south it was decided to venture north for this trip to Kaeng Krachan dam and reservoir and a camp site on the northern edge of the lake. The Mrs had found a little place called Rai Ing Geng to stay at which offered basic bungalows for 600 baht a night or tent pitches for 100 baht. 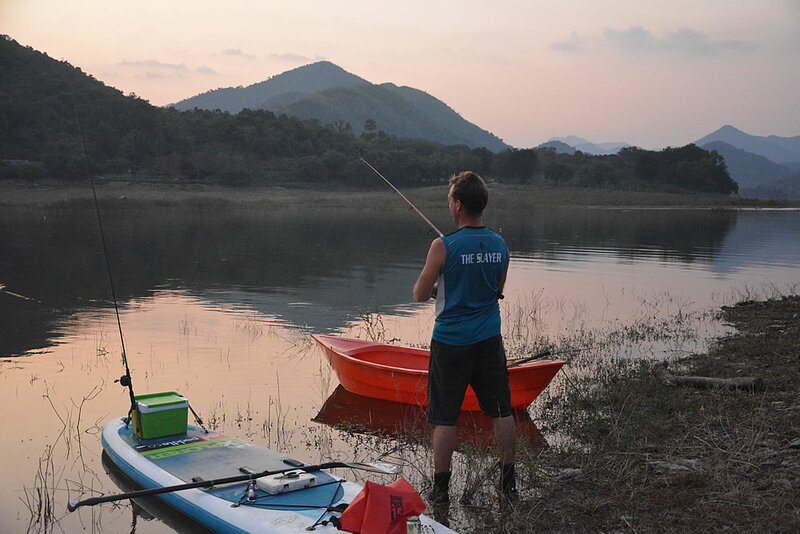 The journey however took longer than expected due to hellish road works from Bangsaphan to Pranburi, an hour’s stock up at Macro, and a visit to a tackle shop in Tha Yang. 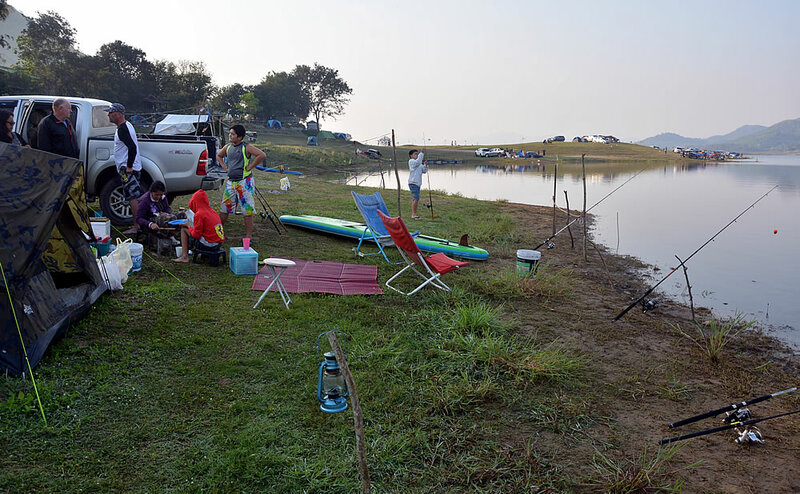 Despite leaving at 6am it was gone midday by the time we arrived and most of the good spots were already taken by Bangkokians getting out of the city for the holiday. 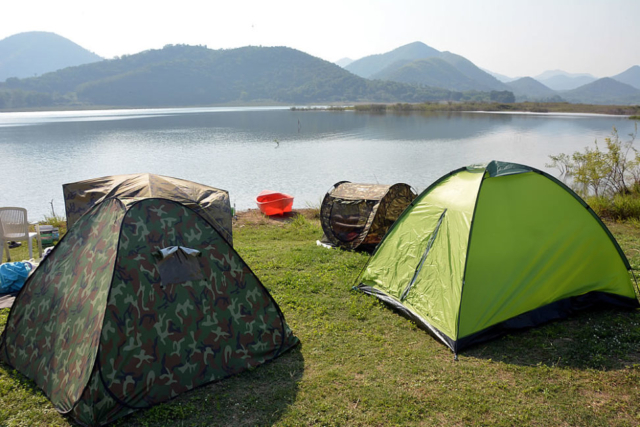 Fortune had it that the place next door called T&P Lake View had similar facilities and pitches and was less crowded so that is where we decided to set up camp. 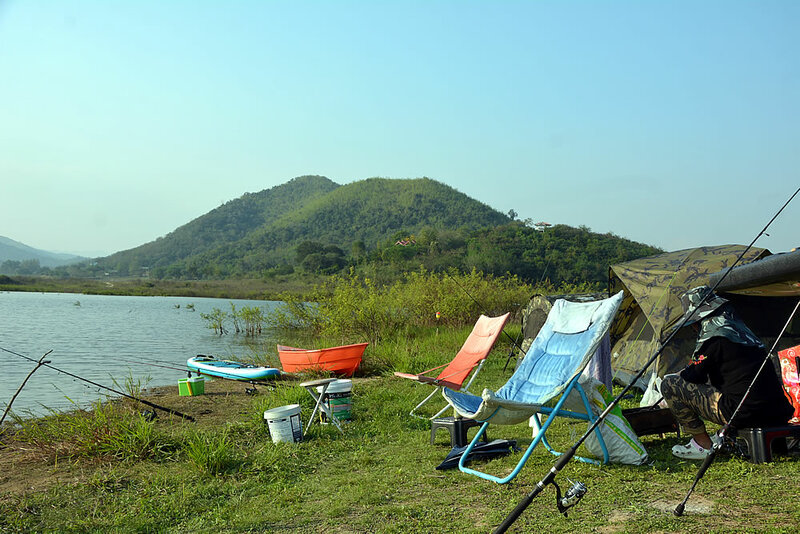 The drawback of the camp site was very little shade and the heat, despite it being February, was quite punishing so a cold beer was welcome once we’d got all the tents set up and the rods out. 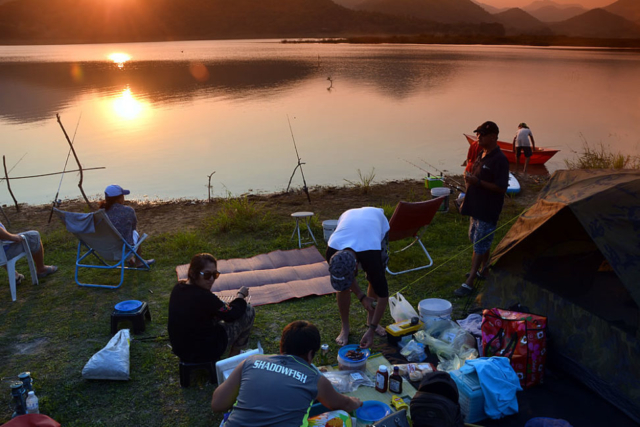 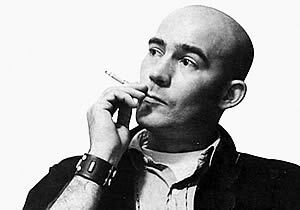 Another drawback was the fact that Thai people like noise and the Bangkokians didn’t hold back with their yappy rat-dogs, screechy scratchy women with voices like Minney Mouse on helium, and of course dire karaoke. 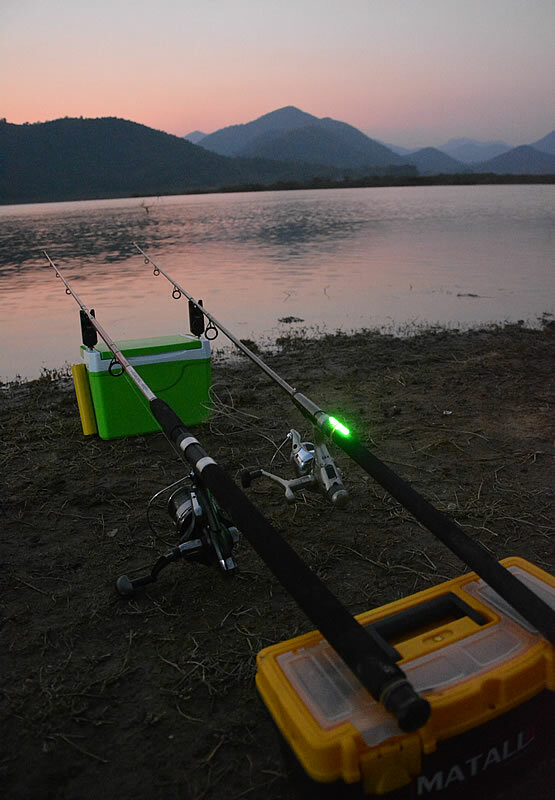 Thankfully we were far enough away from them for it to bother us so we enjoyed the surroundings and hoped for some rod action. 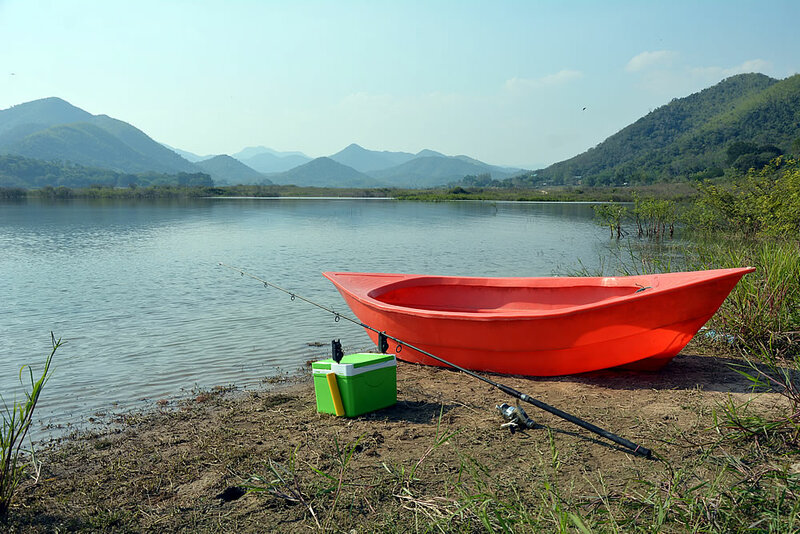 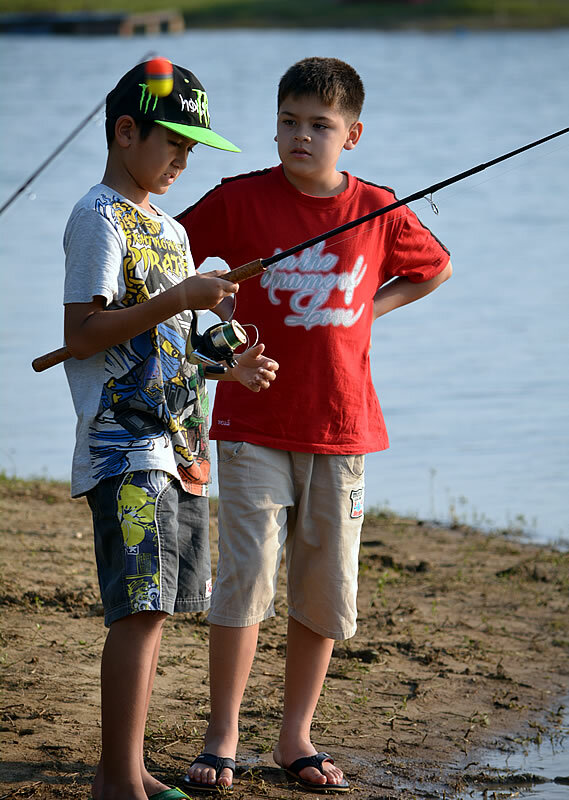 We were fishing with bait cages stuffed with a mash of bread, powder, foul smelling liquid and a bunch of other green stuff the tackle shop recommended, these apparently are favoured by the large catfish that live in the lake. The barbecue was fired up, filling the air with the smell of cooking burgers and bangers, as the sun set directly in front of us, turning the dappled lake surface into a sparkling light show of yellow diamonds. 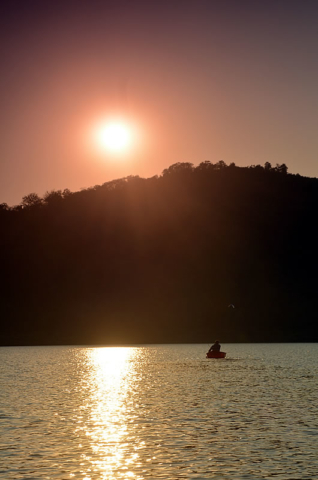 A paddle out into the lake and out of sight of the weekend warriors at dusk rewarded me with a glimpse of several species of water bird and a chance to get the lures out for some snake-head fishing. 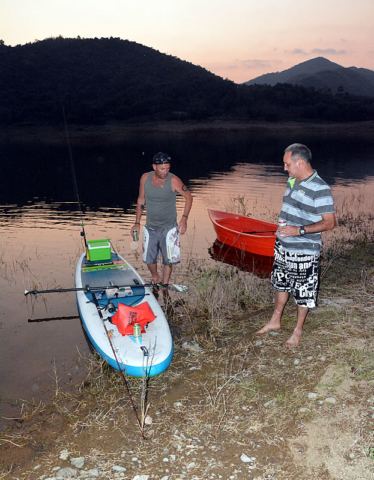 Later on, well after dark, we decided to paddle out and take the baits and lines a lot further into deep water as nothing was happening around the lake’s edge. 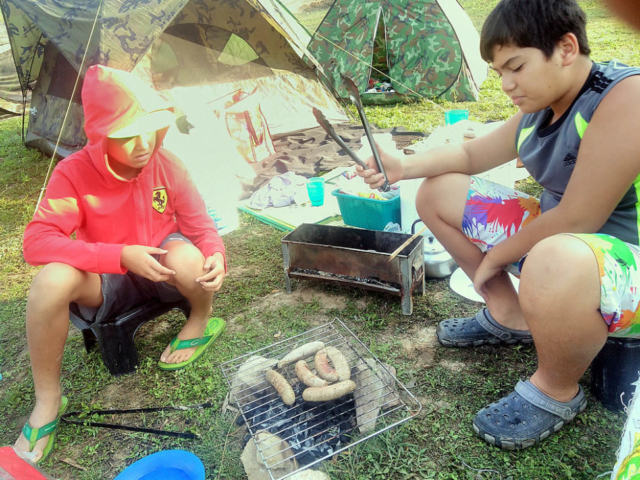 After an early and somewhat chilly start the next morning the kids set to work cooking breakfast on the fire (blank on the fish so we had sausage sandwiches) while we enjoyed a coffee, the sound of bird calls, and the tranquility of the lake which was like a and endless sheet of glass. 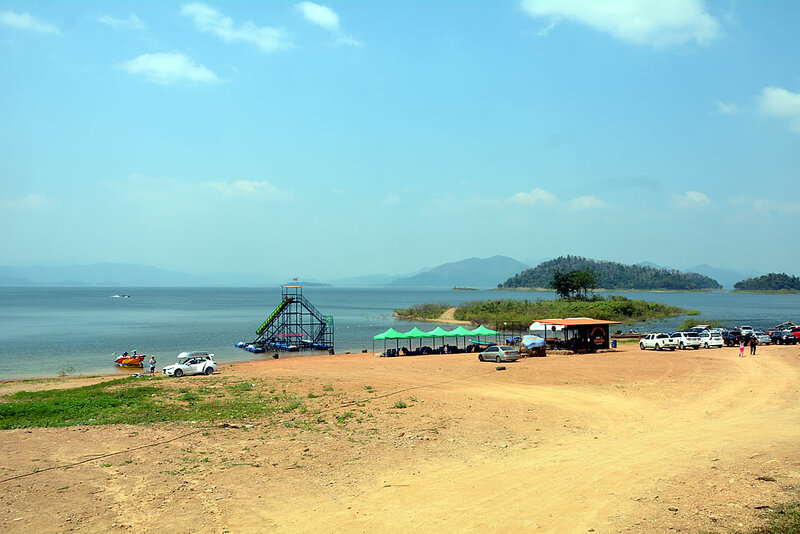 During the day we escaped the heat of the camp site and drove around the lake to the dam area and entrance to the National Park. 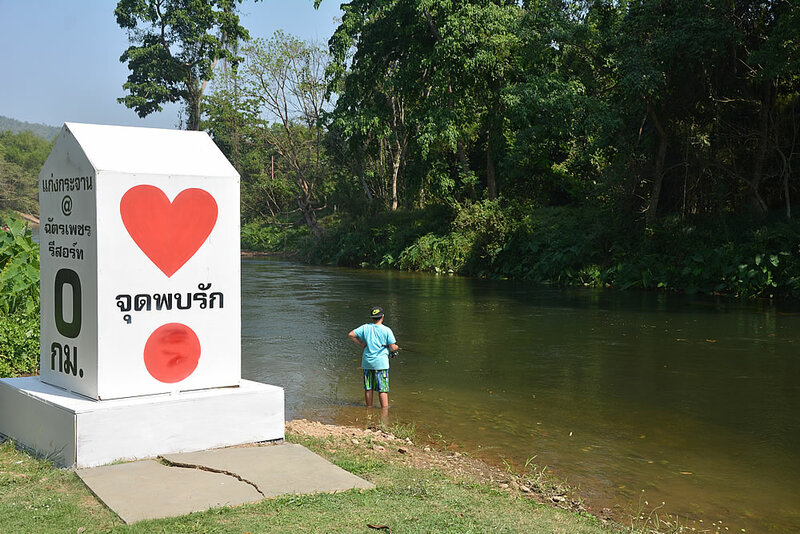 Our last visit here was over ten years ago and it was astounding how touristy it had become; restaurants, coffee shops, souvenir stalls, fancy resorts, seven-elevens, jet-ski and boat hire places … and of course hundreds of people from the big city driving like complete assholes. 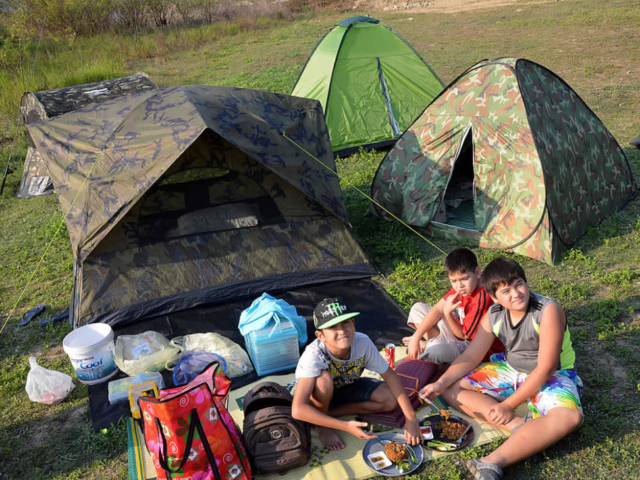 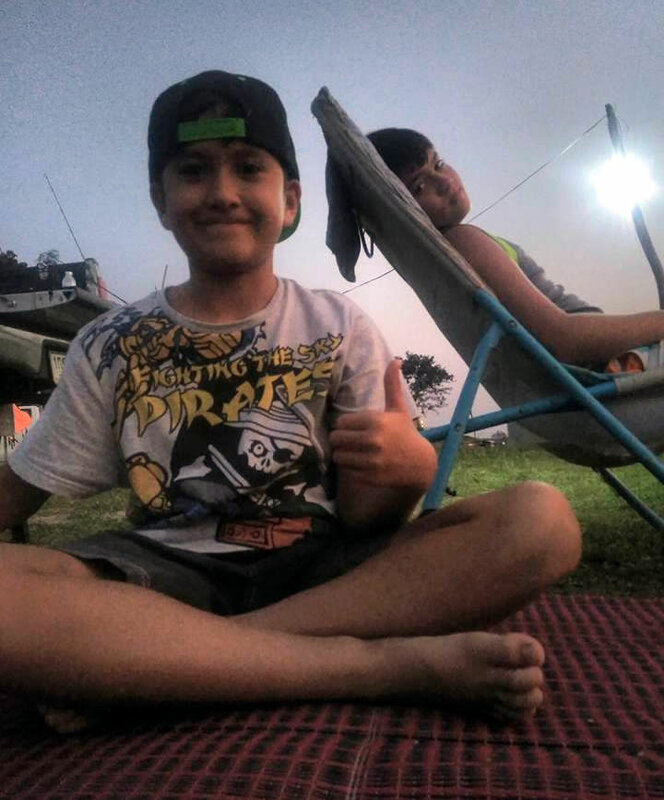 The National Park offers camping spots which apparently were free to Thais, the irony of people turning up in multi-million baht cars and SUVs to stay in a free tent made me chuckle, it was all very crowded and selfie centered so we had a little look, took a couple of shots, and moved on. 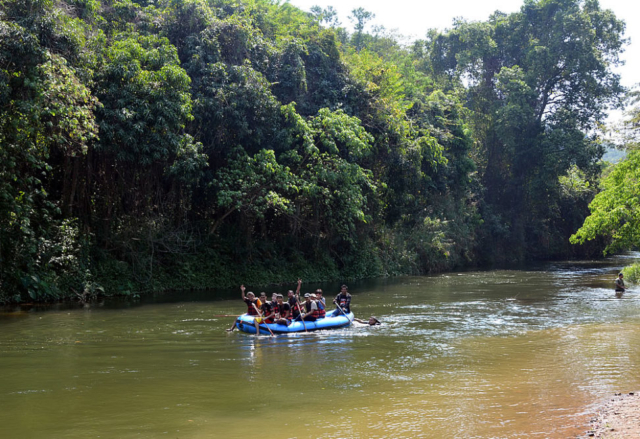 The next spot was down by the river for lunch and a swim, waving at the rafting tours that went by, one almost every 30 seconds. 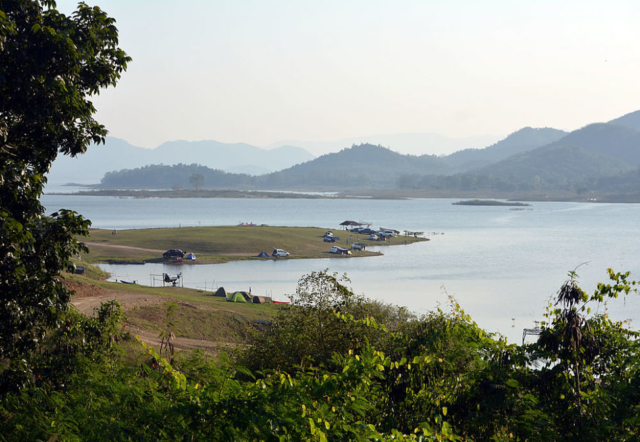 The Electricity Authority who manage the dam release more water during long weekends in anticipation of the influx of local tourists to the area, which of course there were. 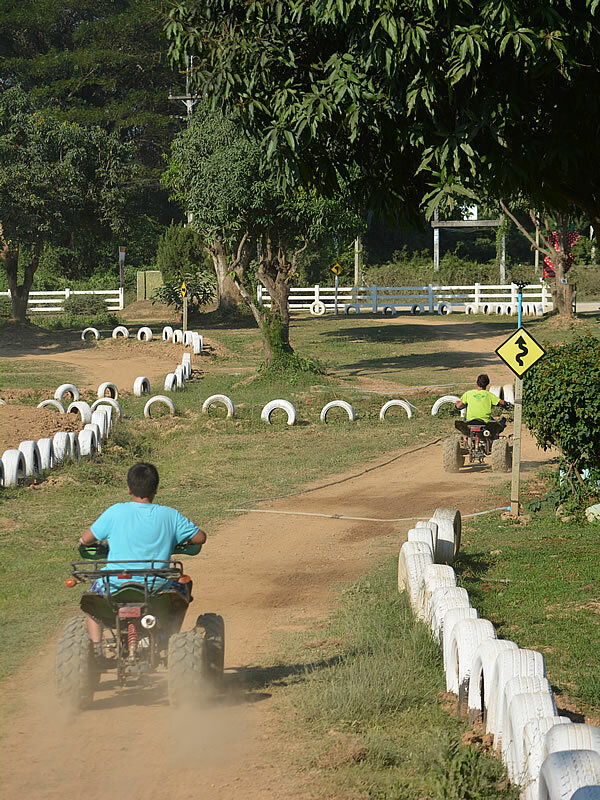 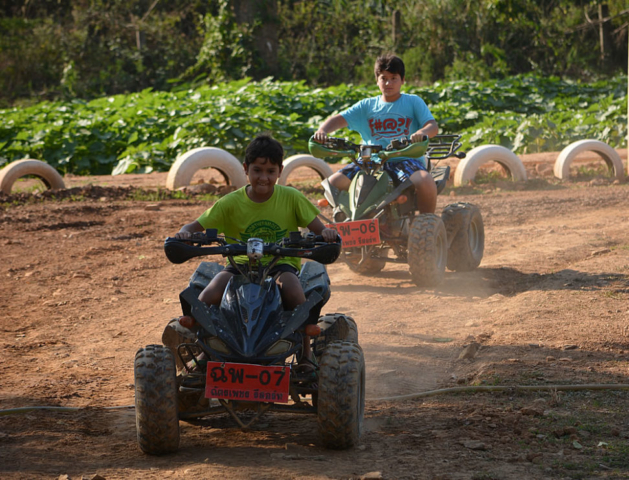 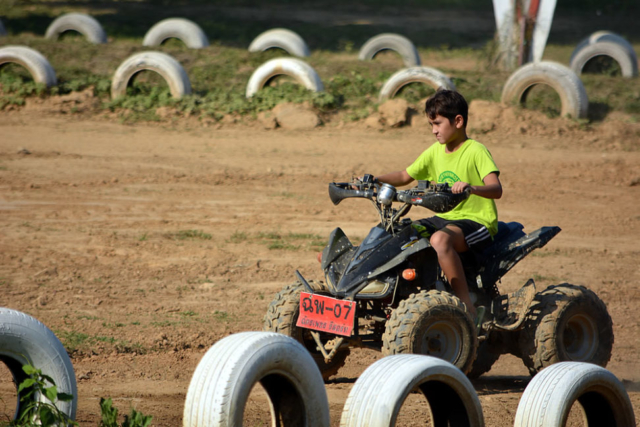 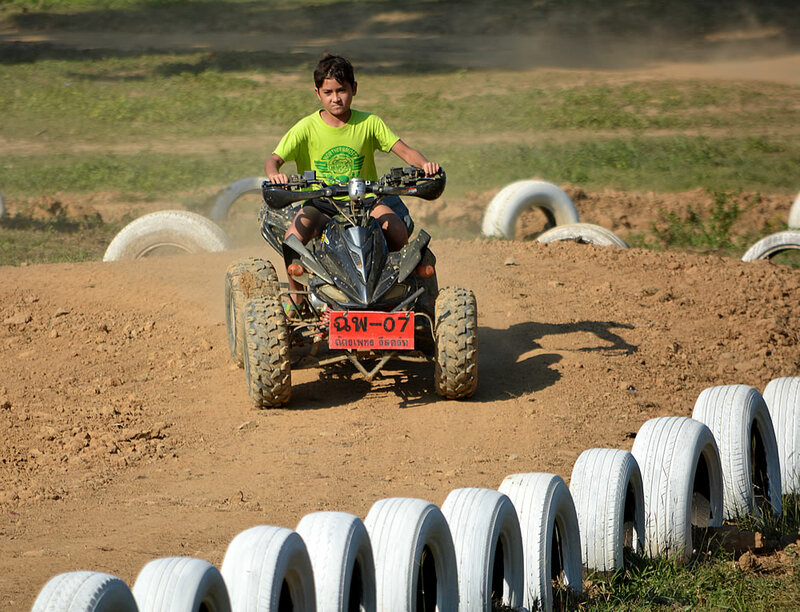 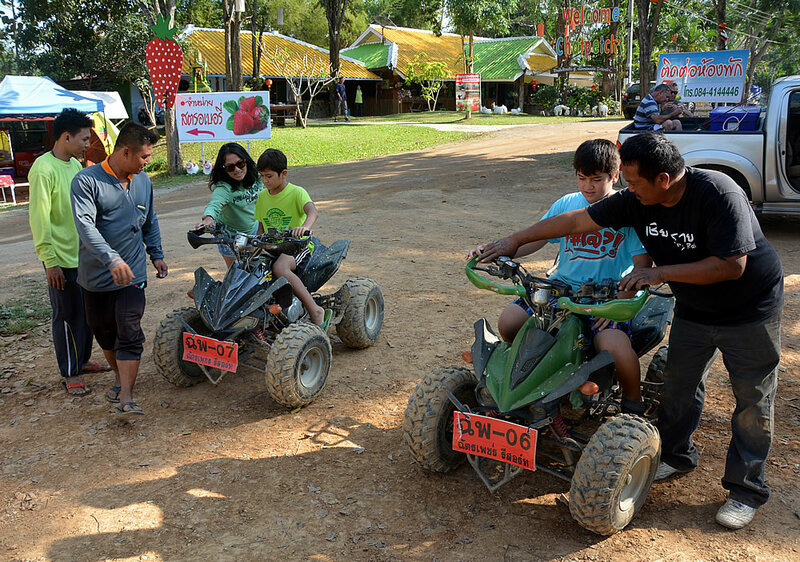 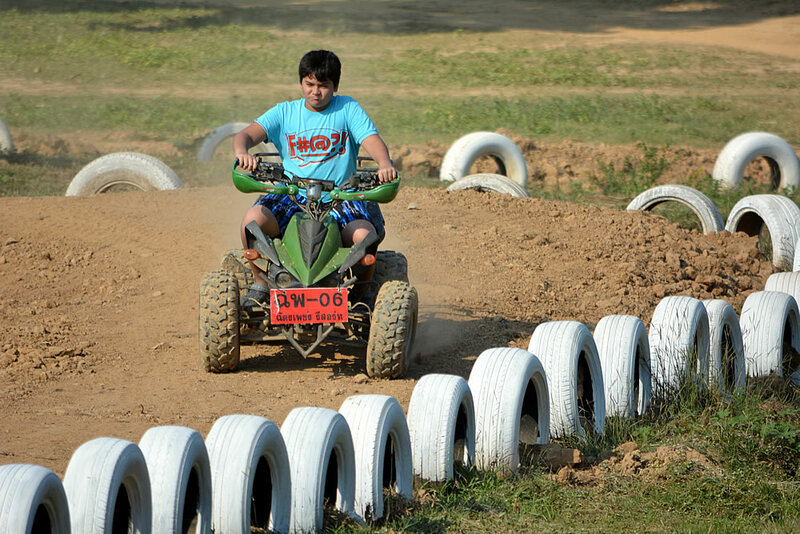 The kids wanted a go at the ATV park so we stopped there on the way back to the campsite. 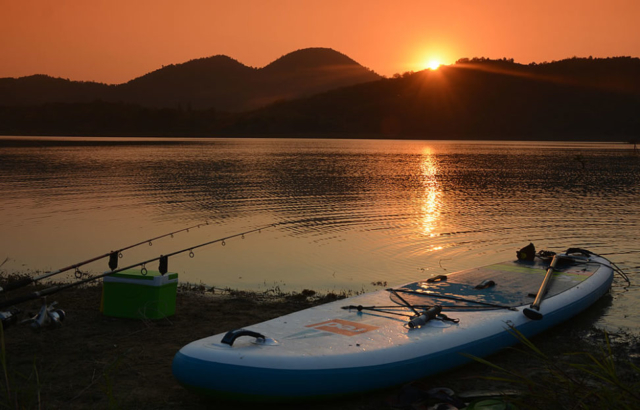 Back at the lake the sun was again dropping to treat us to another splendid sunset and a chance to paddle out to try fishing different spots and with different lures. 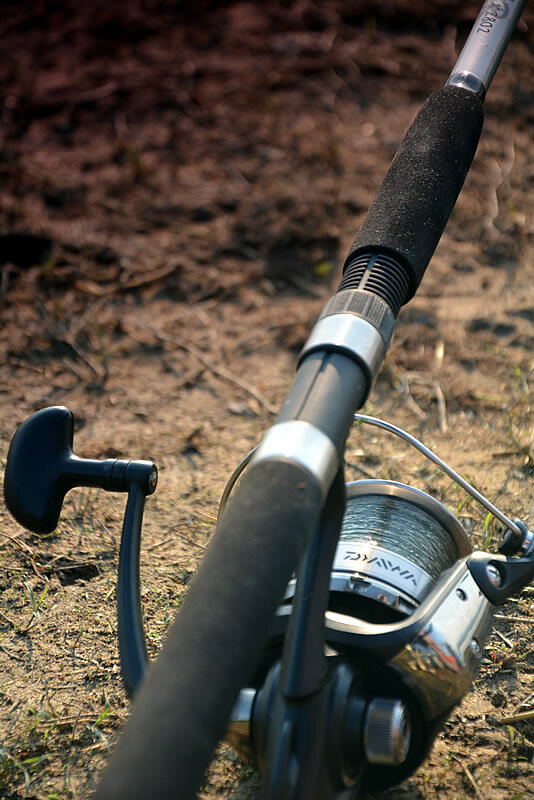 It was then that it dawned upon us why our (and everyone else’s) fishing efforts had been rather fruitless. 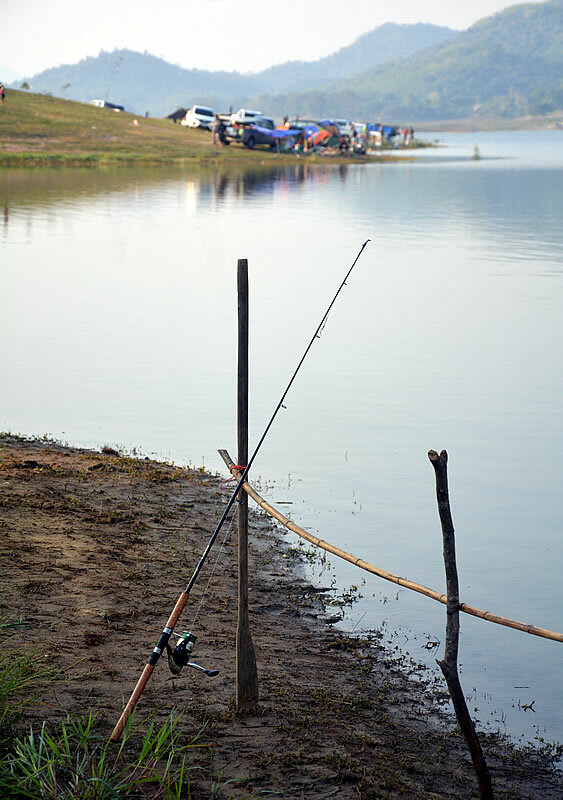 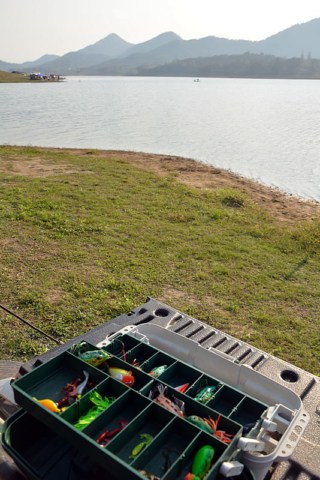 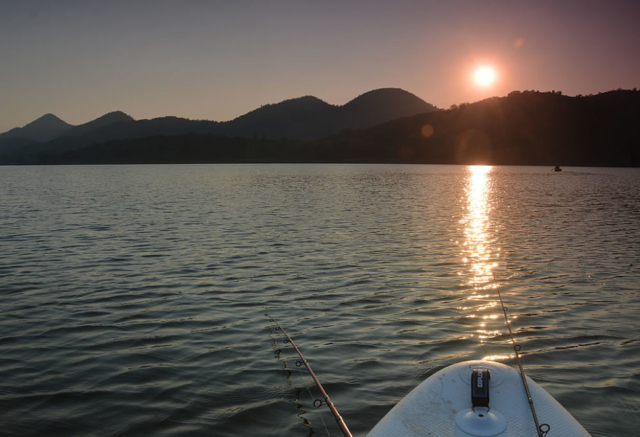 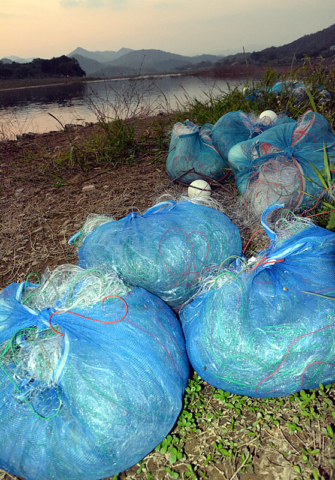 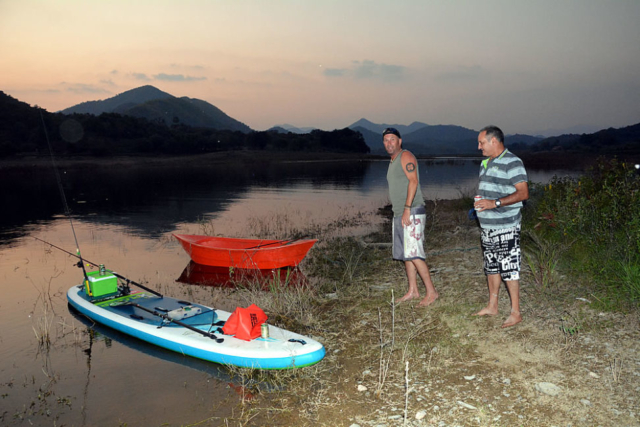 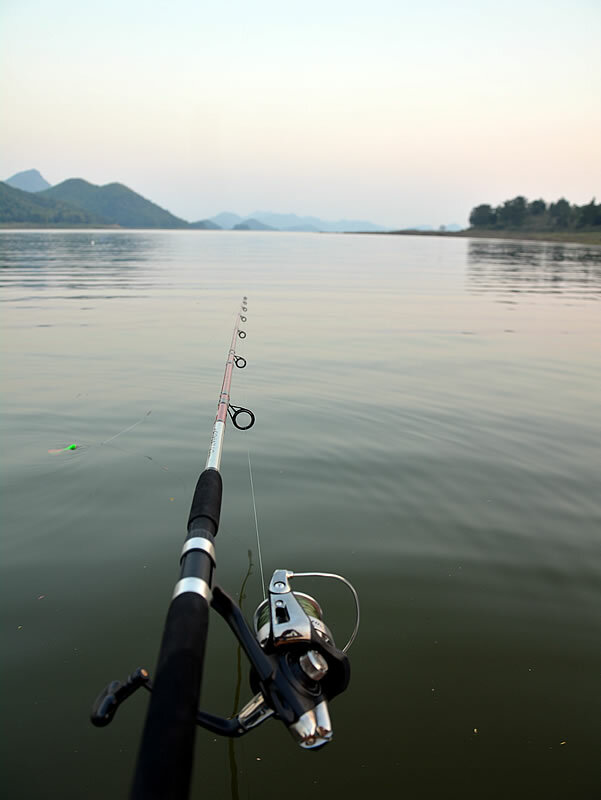 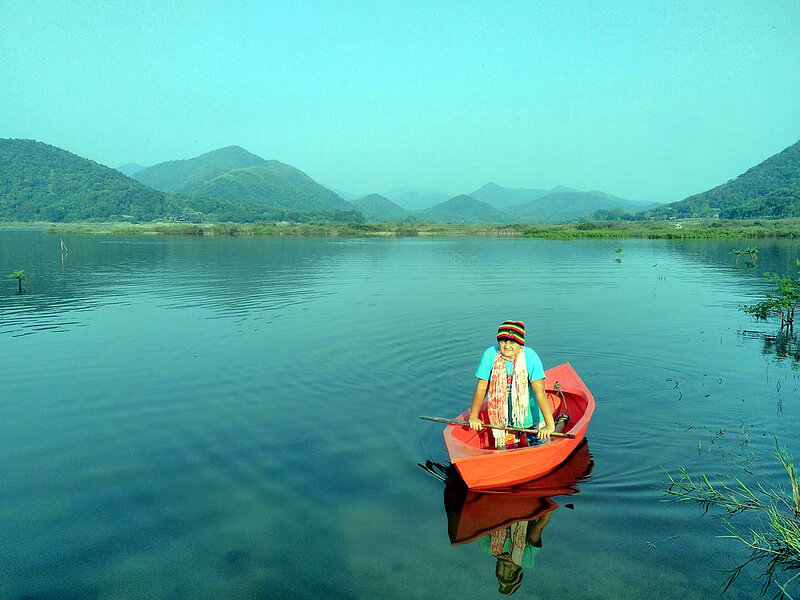 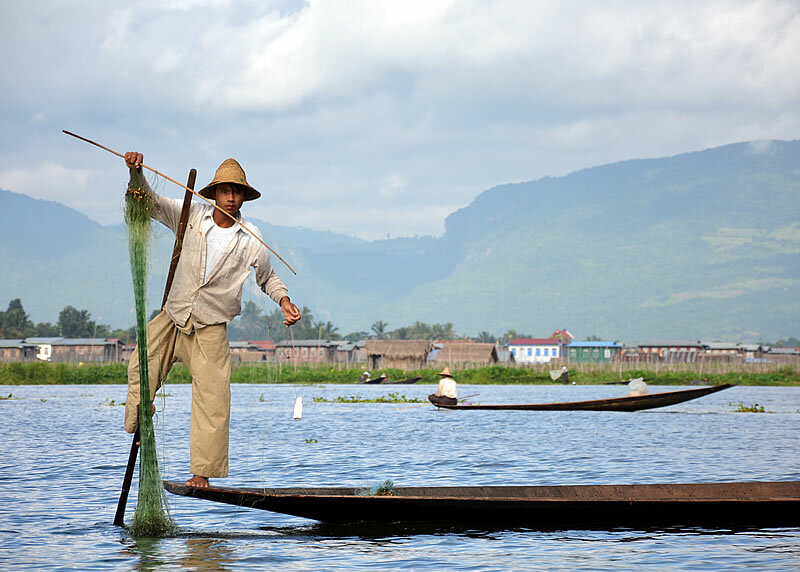 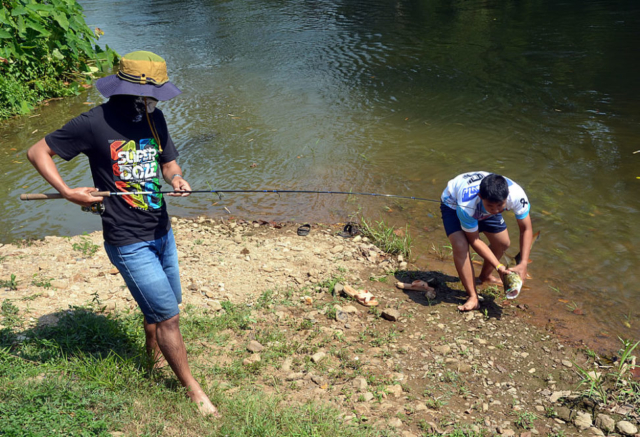 The locals had netted off almost the entire inlet and body of water so any big fish in the area would have already been taken out and the remainder would probably remain deep in the main lake, there were also countless floating bottles with cage fish traps at the bottom of them. Conservation, sufficiency hunting/fishing, and environmental preservation is completely lost on Thailand, it is just a case of ‘me first, think of today, and take it all’. Night two on camp was a more relaxed affair as we’d lost faith in the fishing and just enjoyed the surroundings and nature instead. 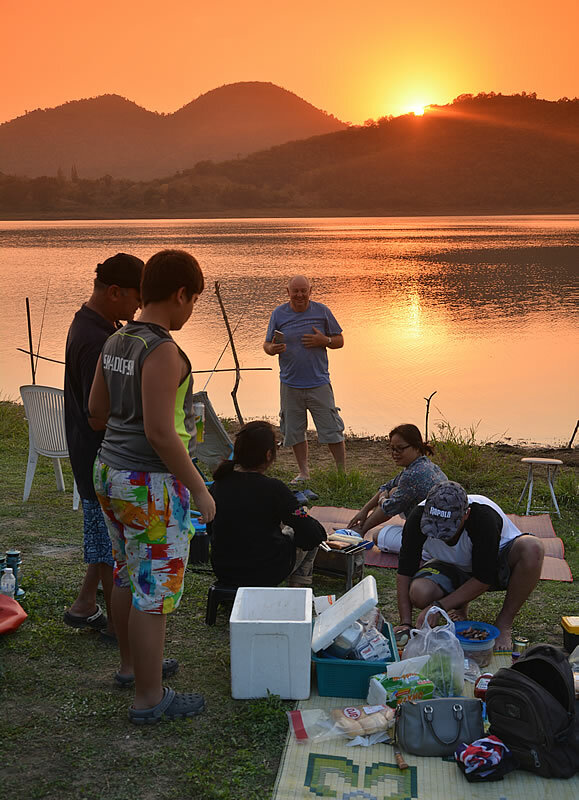 Our only consolation was that very few of the other people visiting the lake had caught anything either, and for us just being there made it all worth while.